When I decided to finally take the plunge into the world of traveler's notebooks, I had no idea the jumbled, confusing mess I was getting myself into. Traveler's notebooks are so customizable that it's hard to really get a grasp on the what's what of it all if you're just getting started. So in today's video (at the bottom of this post) I'm trying to tackle the basics and I'll hash it out here if you want even more goodness. So first things first, sizing. It feels like there's literally every size under the sun that you can choose from, but it's definitely best to poke around and see what's available in sizes you're interested in. Some sizes have a lot more inserts and products available for them than others so if you want to save yourself headaches later, stick to some of the popular ones. I used Foxy Fix's and Chic Sparrow's guide references to help me decide which one to go with. Honestly I really recommend the A6 size. It's not too small or too big, has tons of inserts available, and fits in all sorts of purses. 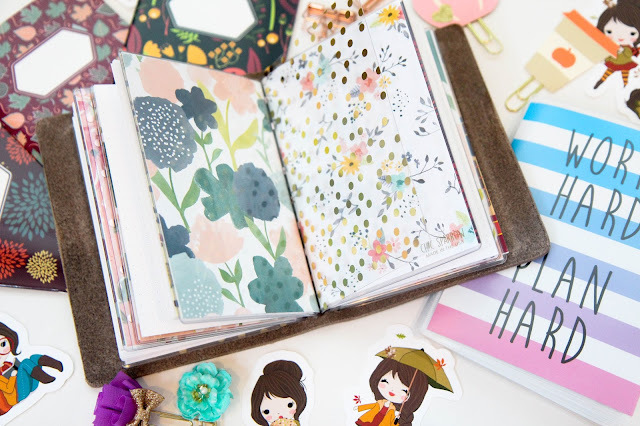 Plus we make seriously adorable notebooks for them so I'm totally biased. Picking a size is difficult, but deciding on a cover is probably the hardest part. There are so many shops out there to choose from. There are fabric cover shops as well as leather ones. And the prices can vary drastically. So if you aren't sure whether or not this is just a planner phase, don't splurge for any of the bells and whistles and stick to the basics. This is the one I went for. Once you get size and cover out of the way things get a lot easier and more fun. Now it's all about the inserts and dashboards. I've been eyeing Sew Much Crafting and Yellow Paper House for actual planner inserts, but for now I'm sticking to dot grid notebooks for to do lists and such. It all depends on what you want to use your notebook for. As for dashboards, it's all about the DIY. I snagged some of these dashboard inserts from Chic Sparrow so I can change out scrapbooking paper to suit my mood and the season. I also finally understand the true purpose of die cut stickers. My extensive collection of The Novel Coffee die cuts are making themselves right at home in my dashboards and on my notebooks. A super easy way to add even more of a personal touch to things. LOVE IT. I'm still getting the hang of this whole traveler's notebook thing, but this is what I've uncovered so far. Definitely leave recommendations and suggestions in the comments!